Full-year trade data have been posted – no increase in manufacturing imports, but exports down, and the 2015 trade deficit in manufactures was the highest ever. Due to a weak 4th quarter, total manufacturing imports finished 2015 slightly below 2014’s level (-0.62%). Imports of manufactured goods reached $1.940 trillion last year, compared to $1.952 trillion in 2014. Imports from China, Mexico, and Korea were up for the year as a whole, while those from Canada, Japan, and Germany were down. China was responsible for 24.0% of manufacturing imports in 2015, followed by Mexico (13.4%) and Canada (10.8%). 2015 was the second highest year ever for manufacturing imports (behind only 2014). 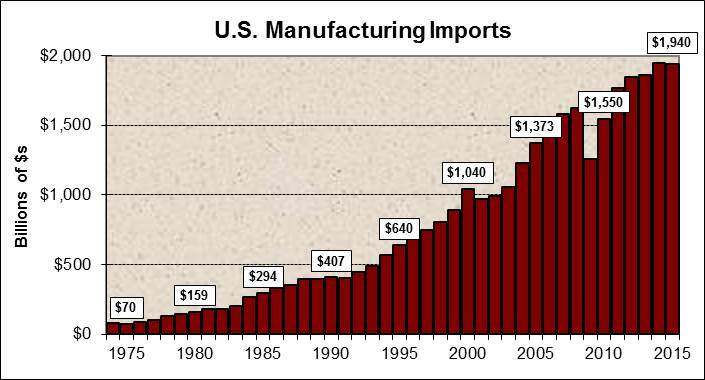 As a result, the U.S.’s trade deficit in manufactured items hit another record last year. 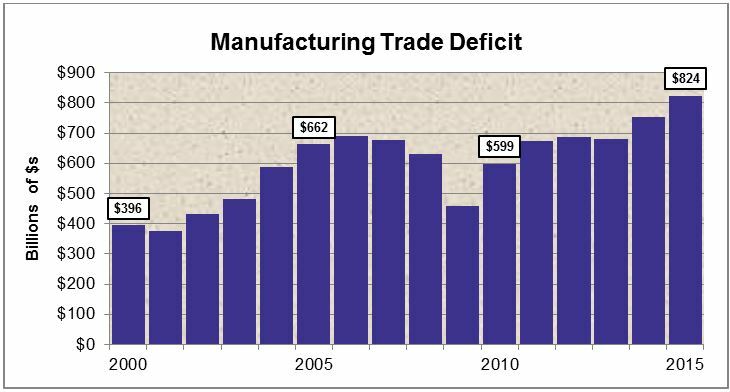 Our manufacturing trade deficit increased from $754 billion to $824 billion in 2015. The U.S. had a negative trade balance with all 6 of our major partners, and the deficit increased for our big 3 – China, Mexico, and Canada. All info from USITC DataWeb. Imports = imports for consumption. Exports = domestic exports. Data in current dollars.